A decade of inspirational quotes offers a vision of hope for a new age. Packed with spiritual insight into the nature of consciousness. 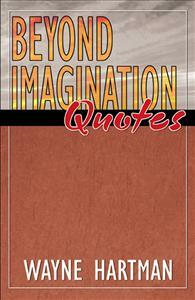 This book is a collection of quotes from the first decade of Beyond Imagination expression in 1993-2003. They are spiritual works that come from the depths of my being. They are what I consider to be the best of the best that has come forth from spirit through me. Quotes are the caliber of ideas that have the power to change the world. Whether these quotes will do that or not, depends on who reads them, and what they are moved to do as a result. My hope is that they will move many to create a better world.